The Association of Jewish Libraries (AJL) has partnered with the American Librarian Association (ALA) to produce a series of webinars on Judaica. 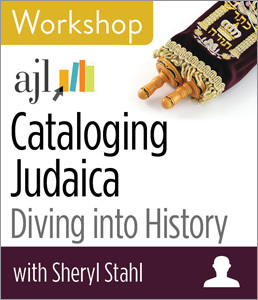 The next webinar in the series is Cataloging Judaica: Diving into History Workshop with Sheryl Stahl on Wednesday, January 10. This session covers many aspects of Judaica cataloging including major time periods of Jewish and Israeli history (including the Holocaust and Jews living both inside and outside of Israel), the development of the different streams of Judaism, Jewish institutions (synagogues, schools, social service organizations, clergy), and multi-disciplinary topics. It is geared to people with some cataloging background but will not assume any Jewish knowledge. It will focus on cataloging in a MARC environment using RDA and the Library of Congress subject heading and classification systems. The presenter will also share her favorite tools for Judaica cataloging. It will not cover Jewish Sacred texts, which was covered in an earlier webinar, or Jewish arts (literature, music, art), which will be covered in future sessions. Sheryl Stahl is a senior associate librarian at the Los Angeles campus of the Hebrew Union College-Jewish Institute of Religion. She began her career as library technical support staff and started doing copy cataloging and then original cataloging. She earned her MSLIS and added many other library tasks to her repertoire. She is an active member of the Association of Jewish Libraries (AJL), the Southern California Area Theological Library Association (SCATLA), and ATLA.